Syracuse, NY. Former Babcock-Shattuck House / Jewish War Veterans' Post today (top) and ca. 1997 when building was saved from demolition. Photos: Samuel D. Gruber. Hopes are high for the development of the long-vacant former Babcock-Shattuck House, which has been listed as a local protected site since 1997 when it was saved from demolition. 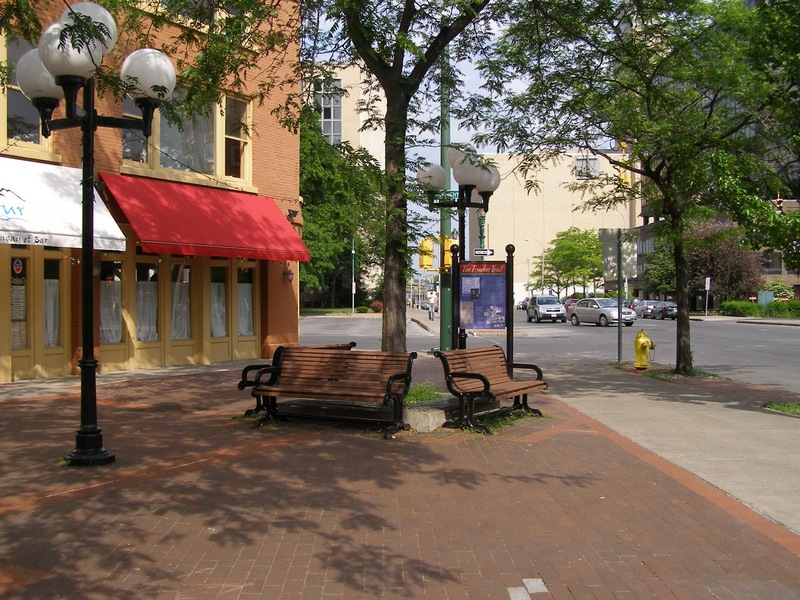 After years of failed activity to shift ownership of the property from the inactive not-for-profit housing organization ENIP, which had planned an arts and cultural center in the building, the City of Syracuse took possession of the property and recently sold it to the University Neighborhood Preservation association (UNPA) which plans to develop the property for residential use. UNPA is a not-for-profit organization, incorporated in 1991. 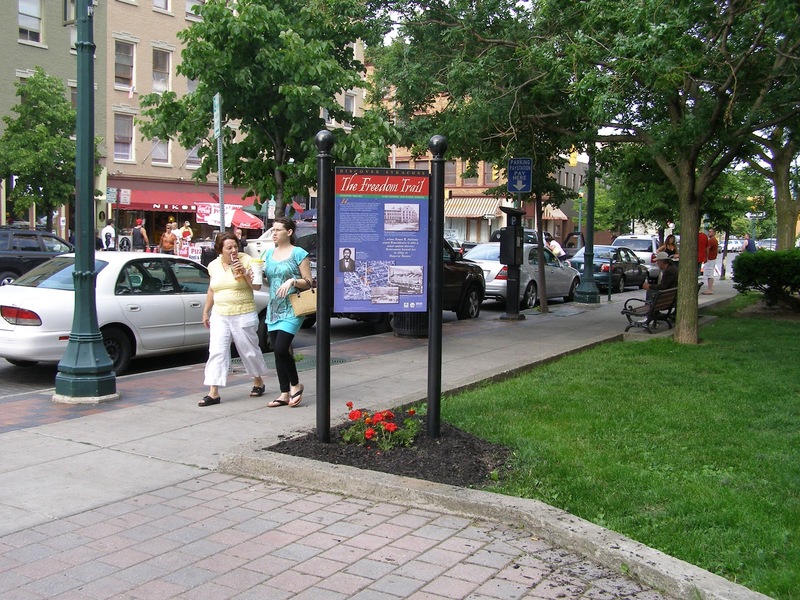 It's mission is to promote owner-occupancy in the Syracuse University Neighborhood immediately east of Syracuse University and the other educational and medical institutions in University Hill, and to market this neighborhood as a great place to live. UNPA was high bidder for the property, essentially paying the city slightly more than ENIP paid for the site fourteen years ago. An UNPA committee (on which I am serving as a community representative) has raised $600,000 for the project through grants and loans. Building renovation will begin in late spring or summer, when the exterior will be restored. As reported in the Post-Standard on Dec 11, 2011 (with a gallery of interior photos) prior to the city approving the sale of the building, a project for four market-rate condominium apartments has been put forward. There is also a possibility of a single occupant use for the structure, or other residential variants. Now that UNPA owns the building, it will make its plans known in the spring. I will be leading a walking tour of the neighborhood in Sunday, March 25 at 1-3 pm which will stop and discuss the history, architecture, urbanism and preservation of the building. We will also visit the nearby deteriorating Gustav Stickley house on Columbus Avenue (tour is free and leaves from Petit Library on Victoria Place). In 1997 when I was Chair of the Westcott Street Development Committee of the Westcott East Neighborhood Association, I researched and wrote a building history which was utilized in the designation of the building as a local protected site - effectively halting its demolition. The building was subsequently listed on the National Register of Historic Places. The following is extracted from that text. History: The house at the corner of Westcott Street and East Genesee Street, commonly known as the Jewish War Veterans' Home, was built as a private residence and first mentioned in a the city directory of 1895 as the residence and office of Dr. Archer D. Babcock (1870-1939). Babcock, who became a prominent Syracuse physician and surgeon and founding member of the staff of Crouse-Irving Hospital appears to have occupied the house until 1913. He later served in World War I achieved the rank of Lt. Colonel and returned to head the U.S. 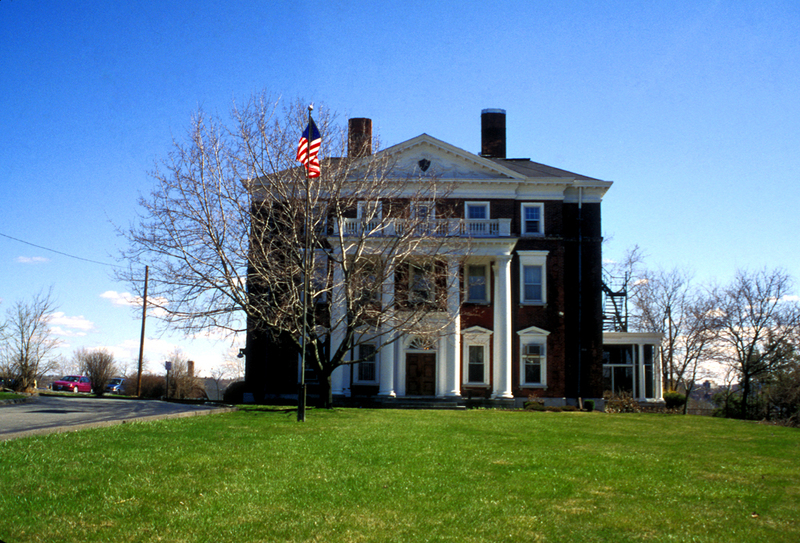 Veteran's Bureau in Syracuse. 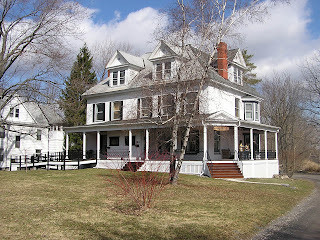 In 1913, the house was owned by Frank M. Shattuck (1888-1959? ), a member of a prominent Syracuse business family, and himself manager of the Syracuse Schrafft's confectionery stores for forty years. In 1925, the house was listed as the residence of Harry H. Elmer (1868-1933), vice-president of the Britton Corp. and treasurer and manager of Globe Malleable Iron and Steel Co. Elmer, as general manager of Haines automobile company, was known as the inventor of a heavy oil type engine which was to revolutionize automobile and tractor and design, allegedly allowing 250-300 miles to the gallon. Plans were being made to produce the engine when Elmer died in 1933, at which work stopped. In 1930, the house was occupied by John Johnson, and from 1931-1933 it is known to have been the 16th-17th Ward Republican Club. 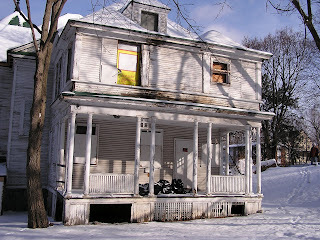 The caretakers of the house were Mr. and Mrs. Martin, and the widowed Mrs. Martin was still living there when the building was sold in 1947 (reportedly for $6,000) to became the home of Onondaga Post No. 131 of the Jewish War Veterans of the United States of America (JWV). The JWV, which had previously rented space on Cedar Street, engaged in fund raising drive to collect the $30,000 needed for the rehabilitation of the building until at least 1953, when a newspaper article reported restoration work in progress. Ownership in the property belonged to the 200 East Genesee Street Corporation, which was made of JWV members, and which, according to JWV Executive committee member Seymour Block, leased the building to the JWV for $1.00 a year. JWV was founded in March 1896 in New York City by Jewish Veterans of the Civil War. At that time the organization was called the Hebrew Union War Veterans. In Syracuse, the organization was founded in 1936, and soon became active in protests against the Nazi presence in Syracuse, picketing a Nazi Bund headquarters on East Genesee and a downtown bank which displayed Nazi symbols. The Syracuse JWV became particularly active shortly after World War II, when so many Jewish Veterans returned home. 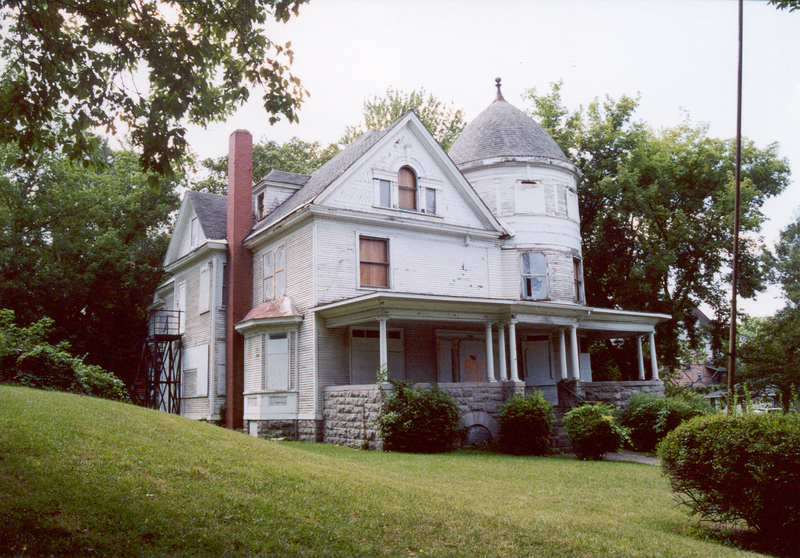 The JWV occupied the building for more than four decades, finally selling the house and moving to new quarters in DeWitt, in the early 1990s. During that time the building served as a meeting and activity center for the JWV. The Post was an active place. In addition to bingo, which was the first Jewish bingo in the city, meetings and memorial services regularly took place. Downstairs was a members lounge, to the left was a special memorial room with the names of Syracuse area Jewish war dead, which was equipped with a small Ark and even a Torah scroll. Before erecting its own building further east, Congregation Young Israel used these facilities for religious services. On the right hand side was a room with a pool table in back. Upstairs was a big meeting room, and the caretaker's apartment. Syracuse, NY. Babcock-Shattuck House after a new roof was put on the tower with Syracuse Neighborhood Initiative funds. Photo: Samuel D. Gruber (Feb. 2006). A few of the many prominent local figures long active at Post are attorney Morris B. Swartz (Commander 1948-49); Ephraim Shapiro, former chairman of Onondaga County Legislature (Commander, 1950); former State Assemblyman Hy Miller (Commander, 1953); Burton Lowitz, former supervisor in DeWitt (Commander, 1963); Judge Maurice Schneider (Commander 1967-68) and Jack Schultz, Town Justice in DeWitt (Commander, 1970). To these names could be added many more worthy citizens. The JWV was always occupied by a caretaker -- Ralph Hoehrl in 1947, William Chase in 1951, John E. Dutcher in 1960, Carl Christian in 1970, Clifford H. Wicks in 1985, and Philip Rice in 1990. Buy the late 1980s the JWV membership had drastically declined, and only a few dozen of the aging members ever came to meetings. The building was very costly to heat, and needed repairs. The Jewish institutions which had once helped define the neighborhood had all moved further east. The decision was made to sell, and to take space at the Jewish Community Center on Thompson Road, a new hub of Jewish communal activity. The building was sold in 1989 to a buyer who proposed a group home for the disabled. This project did not happen, and the property was sold again for about $85,000. the new owner proposed opening a restaurant and to further the likelihood of commercial use, the adjacent house was demolished to allow room for parking, and a variance was granted for parking. Nothing, however, came of this plan either, and the building was forfeited to the city for failure to pay property taxes, and then was sold at public auction in June, 1996 for $19,600 to 84 Associates of Buffalo, a subsidiary (?) of Ellicott Development Co. of Buffalo, Buffalo's biggest landlord and a developer for Rite Aid Pharmacies in Syracuse. Earlier in the month (November, 1996) a permit was denied to the developers for the demolition of the building because it is listed in the 1975-76 Study of City Resources as eligible for nomination to the National Register of Historic Places as a significant city resource. Syracuse, NY. Babcock-Shattuck Photo: Samuel D. Gruber (Feb. 2006). 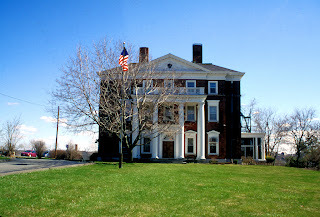 Architecture and Urbanism: The former Babcock-Shattuck Mansion, or the Jewish War Veterans' Post 131, was one of the finest residential buildings in East Syracuse, and its intact exterior -- prominently serving as an important reminder of the prosperity that this part of the City once enjoyed. It remains a considerable source of neighborhood civic pride, despite the fact that it has been empty for the past several years. 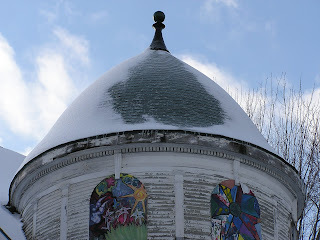 Sited on a small hill overlooking East Genesee Street at Westcott Street, it is one of the most carefully located buildings in the city in regard to vistas, both from within and without. To lose this building would deprive the East Genesee Street neighborhood of its grandest "jewel in the necklace" of grand old homes still standing, and significantly diminish the neighborhood's remaining visual appeal. Since it functions visually and symbolically as the gateway to the Westcott neighborhood business and residential district -- the demolition of this house would a tragic loss, and cause irreparable harm to the architectural and historic integrity of the neighborhood. Built in the Queen Anne Revival style, the large wood-frame structure sits on a prominent rusticated limestone base. Its many attractive features include a spacious front porch overlooking East Genesee Street; a tower with a well-preserved conical roof and a series of arched windows on its top floor; and an a upper story Palladian window on the East Genesee facade. The rusticated base and many of the other building features relate to the adjacent contemporary house to the south on Westcott Street, creating a strong visual linkage between the two buildings. The house is a landmark in the true sense of the word. The building is immediately known to whomever it is mentioned. Generations of residents and urban commuters are familiar with its powerful and reassuring mass and silhouette at Westcott and East Genesee. Built at a time when East Syracuse was opening up for intensive residential use, this grand house was a welcoming vision for the turn-of-the-century professional class that began to settle the area in great numbers at the time. The city atlases of 1892, 1904 and 1924 show how quickly this area (Ward 14) developed at the time, and how central a role the Babcock-Shattuck house played. In its second life as a public building, the building's uses reflect the demographic changes of the neighborhood. Serving shortly as a local Republican Club (but left vacant in the depression 1930s) the building, like much of the neighborhood took on a Jewish identity in the post World War II years. At that many Jews had moved east to the area from area of Adams and Townsend Streets. Two blocks away was the Jewish Community Center, across the street was Congregation Anshe Sfard, and Congregation Young Israel was located at 2200 East Genesee. Built on part of a larger lot owned by W.M. Knapp, the Babcock house was designed with great sensitivity to its site, and continues to serve as a remarkable and essential visual anchor to the entire neighborhood. Set on a slight hill overlooking East Genesee and Westcott Street, the building hugs the corner of the lot, with a circular corner turret accenting the location, the turret pointing like a finger downtown along the main thoroughfare -- East Genesee. Because of the angle at which East Genesee Street approaches Westcott from the west two full sides of the building are fully visible to eastward traffic from a distance. The turret is a beacon on East Genesee beckoning traffic, while the soft curve of the tower's round plan, which rises high from ground level, serves to visually ease traffic into Westcott Street. Thus, approaching Westcott Street from the west or north, the house serves as grand and inviting introduction into an entire neighborhood rich in history and fine family homes. Indeed, several houses by the noted architect Ward Wellington Ward are just a few lots south towards Harvard Street, and the entire block of house between East Genesee and Harvard, though still somewhat dilapidated, contains dozens of fine houses without a single empty lot. The entire street, were it to be nominated, would probably qualify for National Register listing. This is shaping up to be a big week for local historic preservation efforts. Sunday is the PACNY annual meeting. 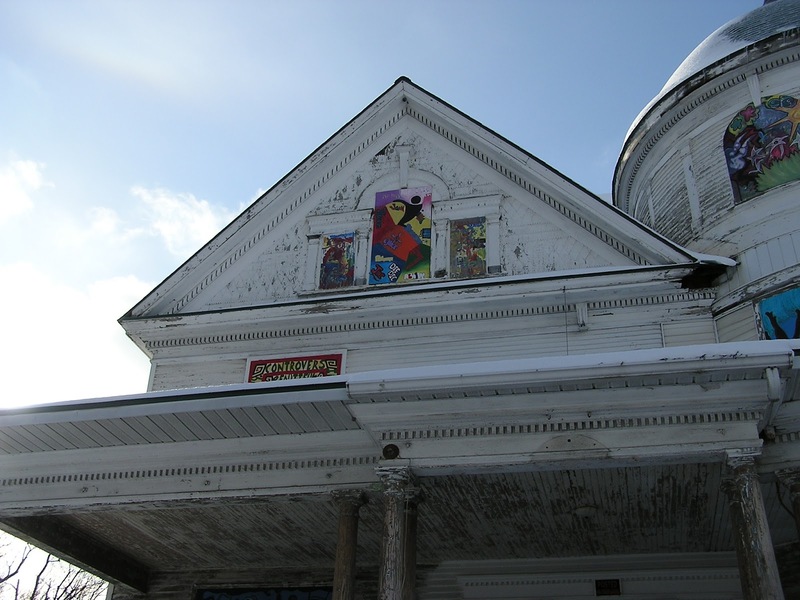 Tuesday night the Erie Canal musuem hosts an evening panel to celebrate the past and future of the former People's AME Zion church at 711 East Fayette. 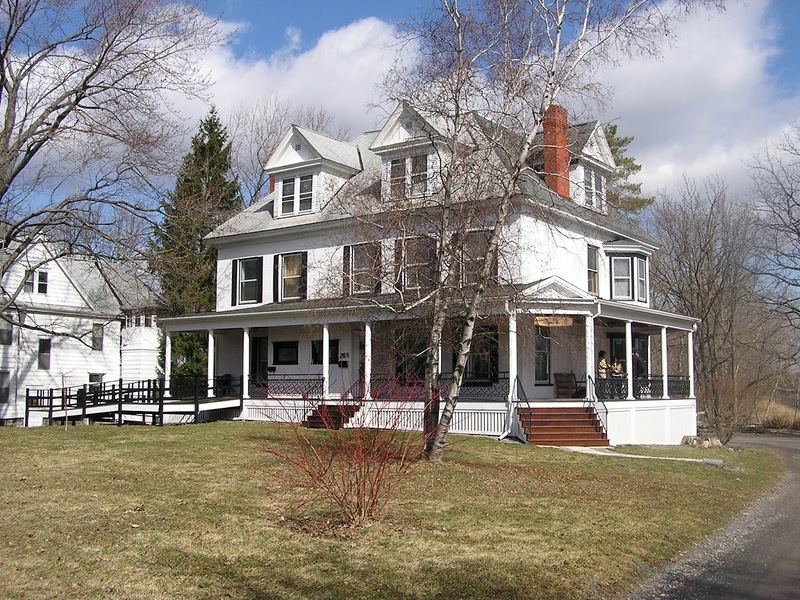 And on Wednesday, February 23 at 4:30 p.m. at the Zen Center of Syracuse an historic plaque will be dedicated celebrating the 1810 residence of Joshua Forman, first President of the Village of Syracuse. 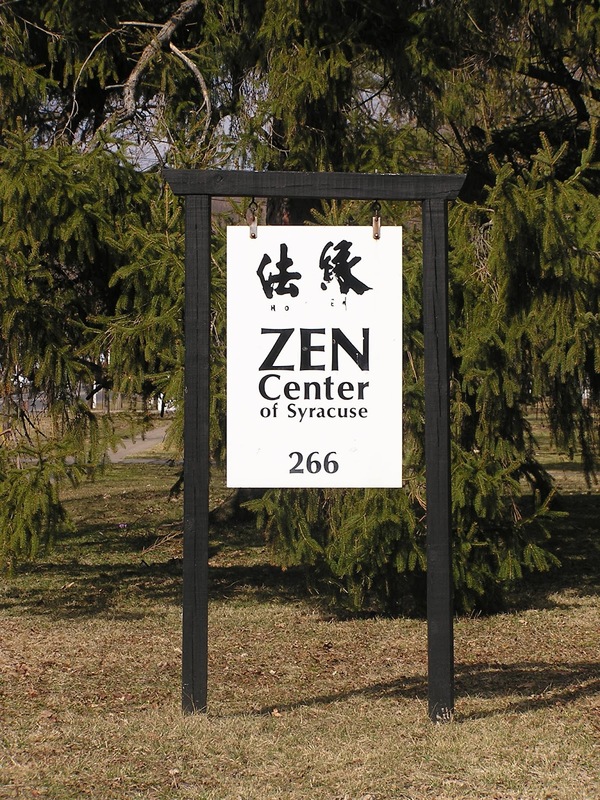 The house has been lovingly restored by the Zen Center since 1996, when it acquired the property at 266 West Seneca Turnpike. 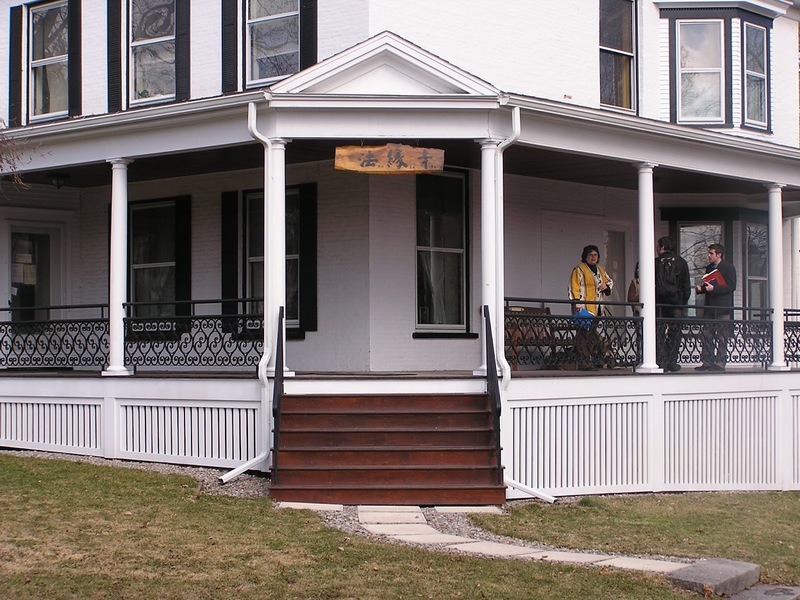 The Preservation Association has given the Zen Center two awards, most recently the TLC award in 2005 for the fine restoration of the front porch. While the house includes elements from the original Forman home, its exterior appearance is mostly the result of a turn of the 20th century remodeling. It remains one of the most impressive and substantial structures on the historic stretch of Seneca Turnpike through Syracuse. The plaque was made possible through a grant from the William G. Pomeroy Foundation, and Mr. Pomeroy will be present at the dedication ceremony. A short reception will follow. Joshua Forman was a New York State Assemblyman who proposed and championed the creation of the Erie Canal, commissioned the mapping of Syracuse’s streets, opened the law office of Forman and Sabine in Onondaga Hollow, established the First Onondaga Religious Society and Onondaga Hollow Religious Society, founded the Plaster Company of Camillus, was appointed First Judge of Onondaga County Common Pleas, and erected two grist mills, among other achievements. He is buried in Oakwood Cemetery. His vision and energy continued to manifest throughout the history of this beautiful house, which has served as a private home, a seminary, and a community gathering place for concerts on its sweeping porches. Neighbors sewed bandages there for soldiers during the War of 1812 and the Civil War. 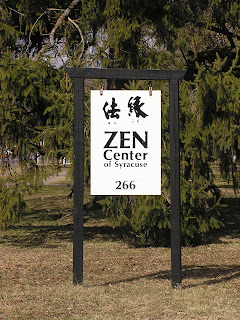 The Zen Center of Syracuse teaches the fundamentals of meditation, offers cultural and educational programs, maintains a community art gallery, commissioned a large-scale public artwork by Haudenosaunee artist Tom Huff, and welcomes people of all religions, races, and ethnic traditions to find inner peace at this six-acre wildlife preserve along Onondaga Creek. Several years ago PACNY helped save the historic Samuel Forman house, home of Joshua's brother and also on Seneca Turnpike, from demolition, after negotiations with a drugstore developer. Almost two years ago I wrote about the need to save the former AME Zion church at 711 Fayette Street in Syracuse. I am happy to say that my words - and those of others - were heard. A group of hard working volunteers have organized a sustained effort to research the history of AME Zion churches statewide, but also to save our fine little building. The group includes historians and activists, and the present-day congregation AME Zion (now in another building), and politicians including my own Assemblyman Sam Roberts. 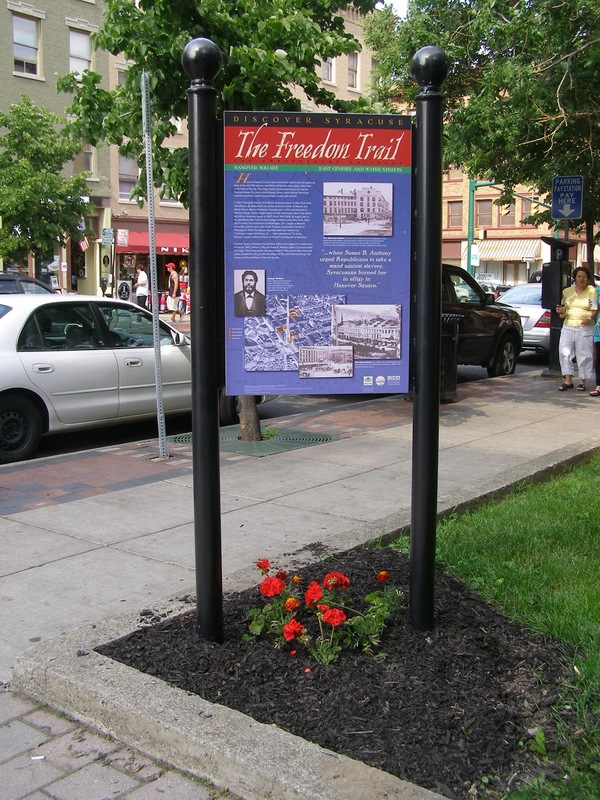 This project follows directly on the work of historian Judith Wellman and creation by the Preservation association of Central New York of Syracuse's Freedom Trail, inaugurated in 2007. To kick off serious education and fund-raising for the building there will be an event on Tuesday evening at the Erie Canal Museum. I'll be part of a panel discussing the past and future of the building, and its history and architecture. The event is in concert with the exhibition at the Museum about Syracuse's 15th Ward - its history and sad fate under the wrecking balls of the 'urban renewal' of the 1970s. The 15th Ward was historically the mostly densely inhabited Jewish and African-American neighborhood in the city. You are cordially invited to attend the Symposium for the People’s AME Zion Church, a fundraiser for the “Save 711 E. Fayette” project and a featured event for the Erie Canal Museum’s 15th Ward Exhibit. 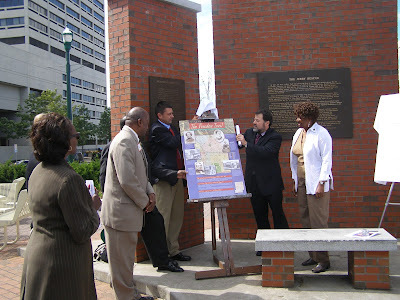 In July 2007, while President of the Preservation Association of Central New York, I had the privilege of unveiling with then-Mayor Matt Driscoll and others the 11-sign Freedom Trail through parts of the City of Syracuse designed to commemorate and teach the important history of Underground Railroad, Abolitionist and African-American historic and cultural sites in the city. 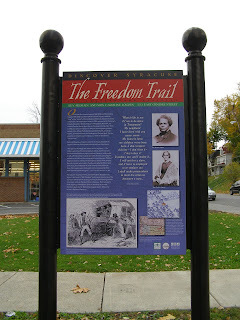 Syracuse was a center of the Abolitionist Movement and the Underground Railroad. The famous Jerry Rescue had already been commemorated in a striking monument on Clinton Square erected in 1990, but there was little else to tell the story of people and places throughout Syracuse. 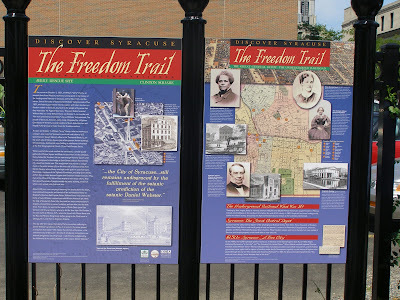 The Discover Syracuse Freedom Trail project was a partnership of the City of Syracuse and the Preservation Association of Central New York and celebrates momentous events in the Syracuse that took place mostly between 1830 and 1860. The signs also remember abolitionists – white and black -who helped make Syracuse a center of the anti-slavery movement in America. 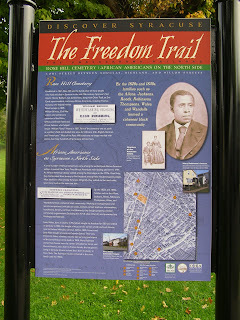 Individuals commemorated included Jermain and Caroline Loguen, Prince Jackson, Samuel May, George Vashon, Thomas Leonard, Stephen Smith, Hamilton White, George and Rebecca Barnes, William “Jerry” Henry, James and Mary Baker, and many others. The primary research and much of the writing for the project was done by esteemed historian Judith Wellman. Syracuse, NY. 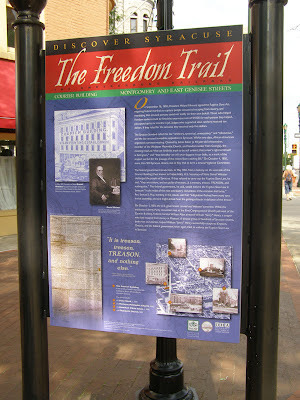 September 2006 unveiling of design for Freedom Trail signs. Parks Commissioner Pat Driscoll, PACNY President Sam Gruber and members of the Network to Freedom. Syracuse, NY. 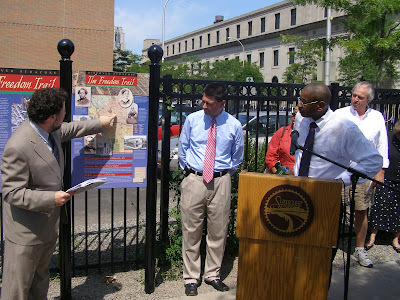 July 2007 unveiling of Freedom Trail signs. PACNY past-president JAE Evangelisti, Councilman Van Robinson, Mayor Matt Driscoll, PACNY President Samuel Gruber and others. Syracuse, NY. July 2007 unveiling of Freedom Trail signs. PACNY president Samuel Gruber, Parks Commissioner Pat Driscoll and Glen Lewis, Parks Department project coordinator. I'm afraid that these signs are still too-little known, and that those who do know them now take them for granted. It took a lot of research and hard work by many people (mostly volunteers) to create this project - and now, during Black History Month I want to remind people of its existence. It was mean, too, to be only the beginning. There are still more places to mark, and this trail can be and should be the basis of a local history curriculum for schools and civic, community and church groups. I look forward to walking and biking the full Freedom Trail route when the weather warms up. Before passage of the Thirteenth Amendment to the U.S. Constitution in 1865, the United States was a land of slavery. New York State had slavery until 1827. In 1860, four million Americans, all of African descent, lived in slavery. Many resisted through flight. 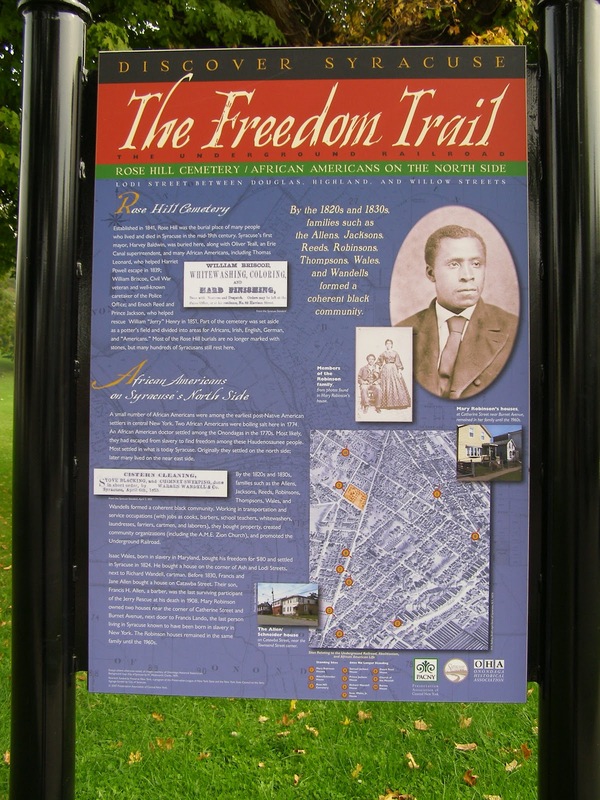 Traveling by foot, wagon, boat, or railroad, between 100,000 and 150,000 sought freedom in Mexico, Canada, or the northern U.S. For its relative secrecy and speed, this flight to freedom became known as the Underground Railroad. Syracuse was the “great central depot” of the Underground Railroad in New York State. From the 1830s until the end of the Civil War, thousands of African Americans passed through Syracuse on their way from slavery to freedom. Here, freedom seekers found help from a biracial group of abolitionist men and women who promoted the end of slavery, worked to end prejudice against African Americans, and organized the Underground Railroad. Rev. Luther Lee, Wesleyan Methodist minister, hosted 365 freedom seekers in one year. AME Zion minister Rev. Jermain Loguen, himself a freedom seeker from Tennessee, and Caroline Loguen sheltered about 1500 freedom seekers. 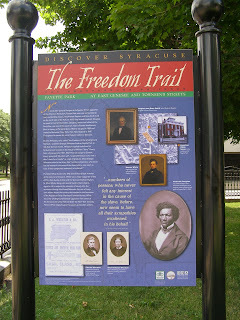 Freedom seekers came to Syracuse on foot and by road, canal, and railroad. In Syracuse, owners of the New York Central Railroad gave them free passes. People escaping slavery arrived either through Binghamton and Elmira in the south or through Albany and Utica in the east. Many traveled on to Canada, going west through Auburn, Rochester, and Buffalo, or north through Oswego. Many also stayed in Syracuse, and some bought property on the near eastside. Jerry Rescue Site, Clinton Street, between West Water Street and Erie Boulevard, just west of Clinton Square. In 1851, William "Jerry" Henry, accused of escaping from slavery, was held in the police station that stood on this site. A crowd of African Americans and European Americans broke open the door and freed Henry, who was taken to Kingston and freedom. This successful rescue was one of several challenges to the Fugitive Slave Law in major cities across the North. It mobilized people in Syracuse to resist the Fugitive Slave Law, and it helped make Syracuse a major haven for freedom seekers in the 1850s. The original police station was demolished and replaced by the Raynor Block, often called the Jerry Rescue Building. The Raynor Block was demolished in the early 1970s, and the site is now a parking lot. 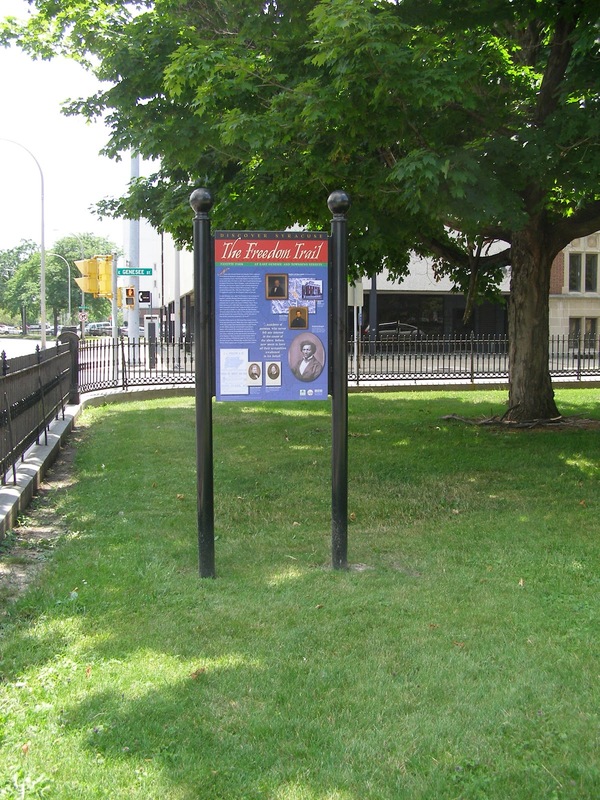 In 1990, Syracuse erected the Jerry Rescue monument on the west end of Clinton Square. Designed by Sharon BuMann, his monument shows Jerry Henry, flanked by Reverend Samual J. May and Rev. Jermain Loguen. Hanover Square was a busy commercial district and civic gathering place in the mid-19th century, and African Americans were highly visible here at the heart of the city. Two major hotels, the Syracuse House and the Sherman House, stood along Genesee Street, where African Americans worked as porters, waiters, housekeepers, cooks, and cartmen. In 1851, George B. Vashon, first African American lawyer in New York State, had offices in the Dana Block, at the northwest corner of Warren and Water Streets. Born in Pittsburgh, Pennsylvania, in 1824 and educated at Oberlin College, Vashon taught classics in Haiti and became New York State’s first African American lawyer in 1847. From 1855-58, he taught Latin at the abolitionist New York Central College in McGrawville, New York. After the Civil War, he practiced law in Washington, D.C., taught at Howard University, and became a clerk in the Treasury Department. He died in Mississippi in 1878. The Syracuse Standard noted that Vashon was “a Scholar, Lawyer and Orator, of . . . high endowments.” St. Louis, Missouri, named a school in honor of Vashon’s contribution to education. Hanover Square witnessed many political rallies, some opposed to abolitionism. In January 1861, Samuel J. May and Susan B. Anthony spoke in Syracuse under the slogan “No Compromise with Slave Holders,” Men armed with knives and pistols invaded the hall, paraded the effigies of May and Anthony through the streets, and burned them in Hanover Square. George and Rebecca Barnes represent European American business and reform families, many of them identified with the Syracuse and Utica Railroad and the Unitarian Church, who were committed abolitionist organizers and Underground Railroad supporters and who used their resources to exert public pressure and to raise money for the cause. In May 1851, from the balcony that still remains on the east side of this building, Daniel Webster, Secretary of State, issued a challenge. The federal government, he said, would enforce the Fugitive Slave Law in Syracuse “in the midst of the next anti-slavery convention, if the occasion shall arise.” This set the context for the famous rescue of William “Jerry” Henry on October 1, 1851. Enoch Reed was the only person convicted in the Jerry Rescue, but he died before he could appeal. It would be helpful to check assessments and maps again, to be sure of this location. 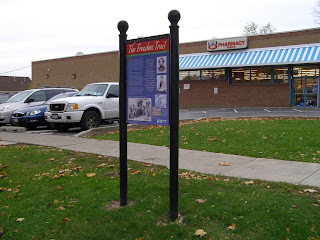 Enoch and Jane Reed lived at the corner of Lodi and Butternut Street (where the Rite-Aid Drugstore is now). Many outstanding houses once stood around Fayette Park, including the home of abolitionist Stephen Smith, who invited Frederick Douglass to speak in Fayette Park in 1847. Douglass, orator and editor of the North Star, was one of the country’s most influential abolitionists. Born in slavery in Maryland about 1817, he escaped in 1838 and moved to Rochester, New York. Throughout his career, he was a frequent visitor to Syracuse, working closely with local abolitionists. Hamilton White lived in the Greek Revival mansion at the southwest corner of the park, built in 1842. White gave money to the AME Zion Sunday School and to the Syracuse Orphan Asylum, and his brother Horace gave passes on the New York Central Railroad to freedom seekers. 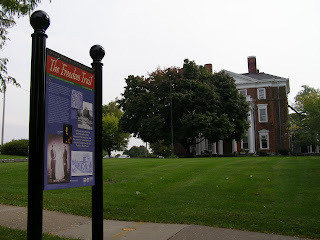 Instead of going to Canada, many freedom seekers stayed in Upstate New York. 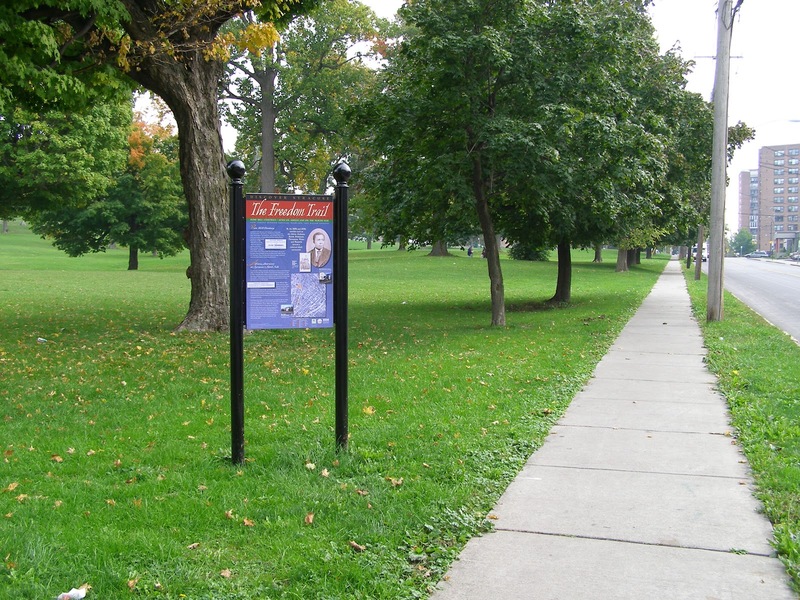 In Syracuse, they purchased property throughout the city, but especially on the near eastside, close to the African Methodist Episcopal Church, the Second Congregational Church, and the mission School. In this area lived freedom seeker Thomas Leonard, who assisted Harriet Powell in her famous escape of 1839, who with his wife Jane kept a sage house on the UGRR, and who, as an old man, tried to enlist to fight in the Civil War. 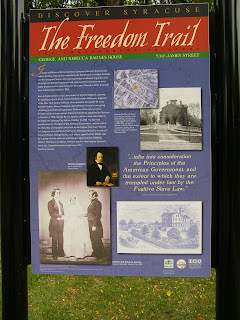 Other freedom seekers on the east side included Elisabeth Crown, William and Sarah Brisco, Edward and Arabella Whipple, Margaret and Alexander Montgomery and Samuel Castle. Most famous of all were Jermain and Caroline Loguen who lived on east Genesee Street a short distance from Lexington Park. 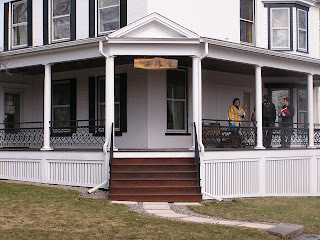 While many abolitionists, both African American and European American, aided freedom seekers in Syracuse, Jermain and Caroline Loguen’s home became the major stopping point by the mid-1850s. 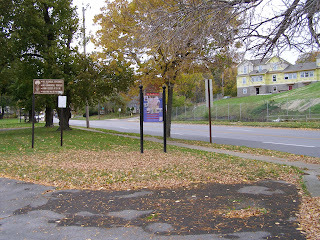 As Milton Sernett noted in North Star Country, Syracuse became known as “the great central depot” of the Underground Railroad in New York State, the “Canada of the North,” and Loguen was called the “Underground Railroad King.” (162, 174) This is the single most important site for underground railroad activity in Onondaga County. Houses on North State Street that date from the 1820s through the 1850s. Several of these exist and help us understand the neighborhood context in which Prince Jackson (indicted for his part in the rescue of William “Jerry” Henry) and other African Americans worked along the canal. 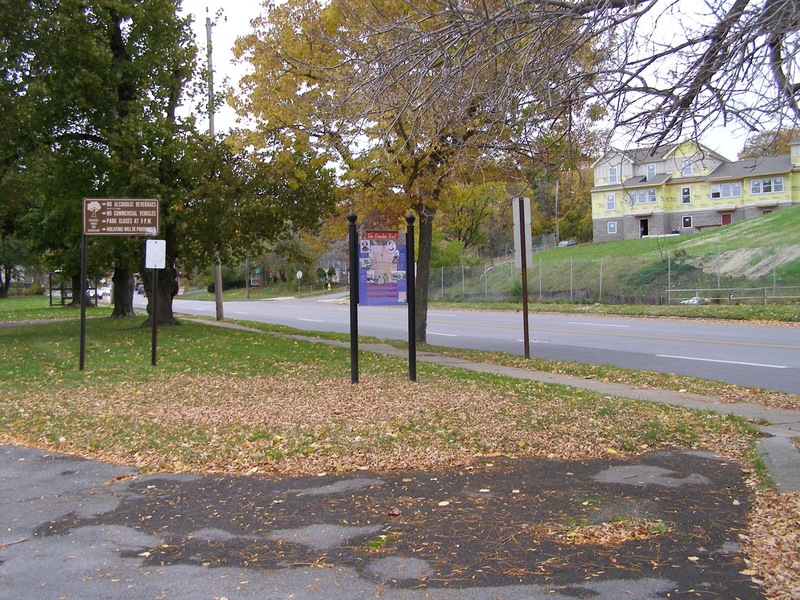 Rose Hill Cemetery was the burial place of almost all African Americans who lived and died in Syracuse before the Civil War. Known abolitionists include Prince Jackson (indicted for his part in the rescue of William “Jerry” Henry) and Thomas Leonard, who assisted Harriet Powell’s escape in 1839. The Wesleyan Methodist Church was a biracial abolitionist congregation and a major center of the Underground Railroad. Luther Lee, pastor (1843 and 1852-55) and editor of the True Wesleyan (1844-52), assisted as many as 365 freedom seekers a year. Charles, Montgomery, and Chloe Merrick raised money and supplied passes on the railroad to freedom seekers. James Baker, Georgia-born whitewasher, and Mary Baker, his Maryland-born wife, were freedom seekers themselves. After helping to rescue William “Jerry” Henry in October 1851, the Baker family fled to Canada. 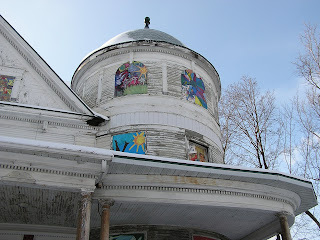 Today the church houses The Mission restaurant. The Syracuse Freedom Trail commemorates places, people and events in Syracuse significant in the history of the 19th-century Abolitionist Movement and the Underground Railroad. 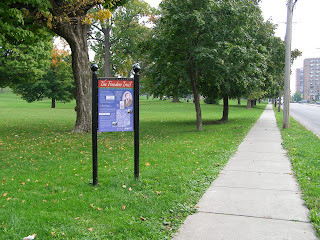 The series of eleven illustrated information signs is a project of the City of Syracuse and the Preservation Association of Central New York (PACNY). Installation of the signs, will begin at Clinton and Hanover Squares, and continue at sites throughout the city during the summer of 2007. 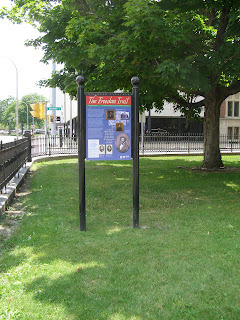 The Freedom Trail project developed following PACNY’s leadership role in the rescue and conservation of the Wesleyan Methodist Church Faces, which had been deteriorating in situ beneath the abolitionist church located at Columbus Circle. 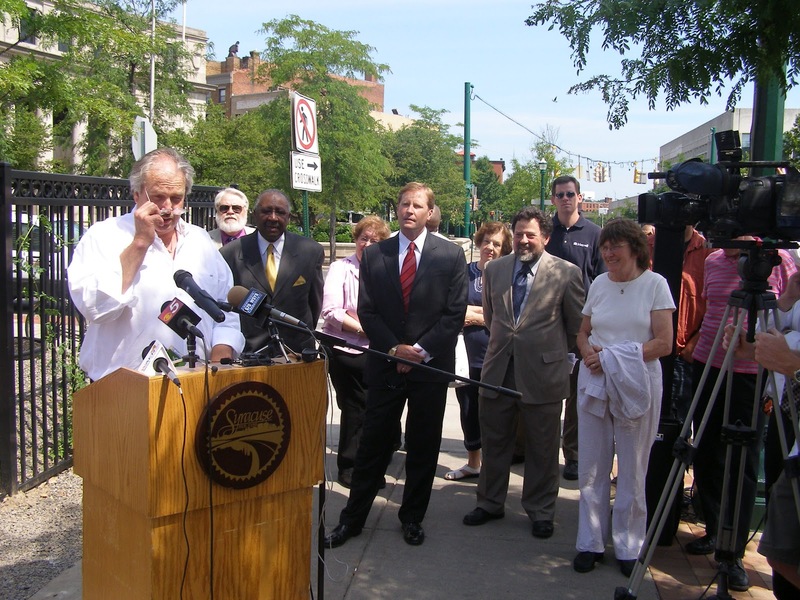 PACNY helped create a coalition of community groups including the Central New York Community Foundation, the Onondaga Historical Association, Bethany Baptist Church and Syracuse University to ensure that the Faces stayed in Syracuse and were protected and conserved. 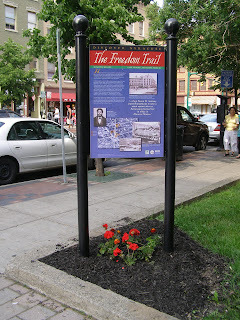 (http://www.pacny.net/freedom_trail/). Subsequently, the Syracuse Common Council, at the urging of then member Kate O’Connell and supported the rest of the membership, allocated fund for the manufacture of signs for a Freedom Trail provided PACNY create the signs. PACNY, in cooperation with the City Department of Parks and Recreation and Community Development and with input from local community and TNT groups, chose appropriate sites for the placement of signage, developed a format and overall design, undertook additional research, obtained illustrations and maps for use on the signs, and then wrote and edited appropriate texts. 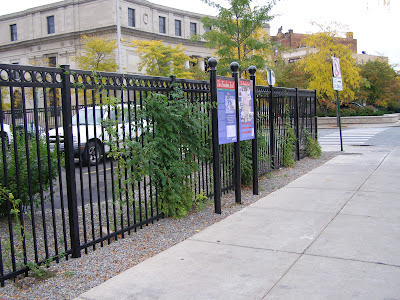 PACNY also negotiated with contractors for graphic design, and for the manufacture of the signs and their metal frames. 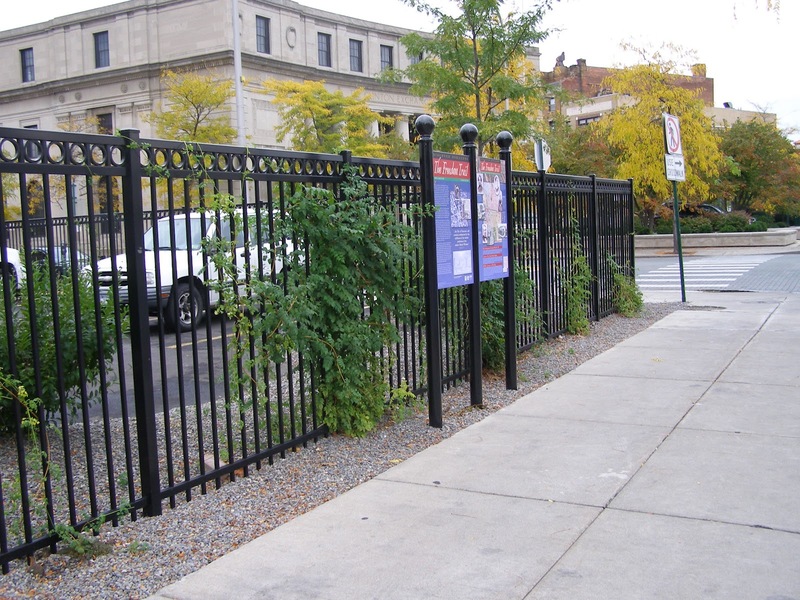 Original research for this project by PACNY was made possible by a grant from the Preservation League of New York State and the New York State Council on the Arts. Funding for the manufacturer and installation of the signs comes from the City of Syracuse. The research, writing and editing of texts is the work of PACNY volunteer members led by Prof. Judith Wellman. The Queri Development Company provided additional funding. PACNY, the City of Syracuse Department of Parks and Recreation, and the City of Syracuse Department of Community Development thank the many people who have made this project possible. Special recognition is due to Dr. Judith Wellman who headed the research team. J.A.E. 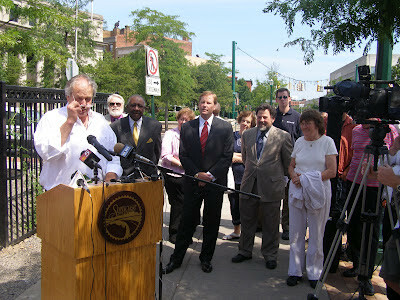 Evangelisti who headed the production team; the staff of the Onondaga Historical Association, which provided help throughout the project; Commissioner Pat Driscoll and the staff of the Department of Parks and Recreation and Commissioner Ortiz and the staff of the Department of Community Development. The implementation of this project was assisted by Dennis Connors, Beth Crawford, Samuel Gruber, Vanessa Johnson, Milton Sernett and many others. Sunday, February 19, 2012, 2-4pm. Join the PACNY board, members and friends for a review of preservation-related events over the past year. Syracuse Mayor Stephanie Miner is the featured speaker. You’ll also have an opportunity to enjoy the Barnes Mansion. Built in 1853 as the first home on the hill on James Street, this Italianate residence was largely remodeled in 1878 and 1882 by Joseph Lyman Silsbee. In 1893-94, George and Rebecca Barnes's daughter, Mary Elizabeth Barnes, hired Henry Wilkinson to add a third story and a Colonial Revival façade. Purchased by the Corinthian Foundation in 1947 and occupied by LeMoyne College for one year, the house narrowly escaped demolition in 1948. It is now the home of the George and Rebecca Barnes foundation. Please support PACNY by becoming a member to create a larger voice of Preservation in Central New York. Membership forms will be available. Donations accepted.